Information regarding Kingdom Hearts' Kairi, including her Keyblade, voice actor, and role in Kingdom Hearts' story. 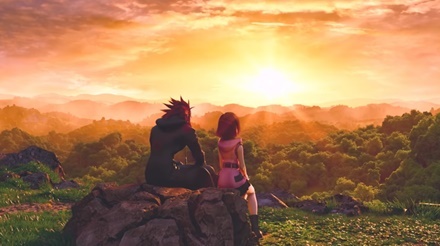 In Kingdom Hearts 3, Kairi is seen together with Lea, formerly Axel of Organization XIII, on a hill overlooking the horizon. The two seem to have become fond of each other ever since Lea had joined the heroes on their adventure. 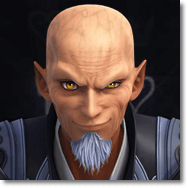 After the events of Kingdom Hearts 3D: Dream Drop Distance, Kairi and Lea are sent to Merlin to train as Keyblade wielders. The time Kairi and Lea spent together as students of the wizard seem to have forged their bond and may play a key role in the events of Kingdom Hearts 3. A young Kairi meets Aqua and King Mickey in her original home of Radiant Garden. Aqua saves her from several Unversed and unintentionally initiates a Keyblade Inheritance Ceremony with the girl. 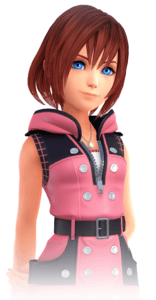 Though unaware that Kairi is one of the Princess of Heart, a maiden who, along with the other princesses, can open the way to Kingdom Heart, Aqua senses a pure light in the child’s heart. 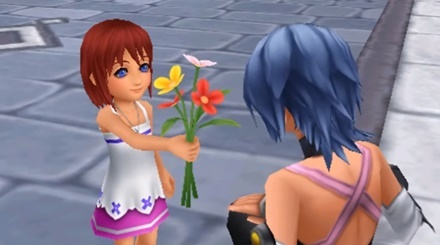 Kairi gifts Aqua with flowers she picked before being attacked by the Unversed. Aqua presents the girl with a protective charm for Kairi to put on her necklace to keep her safe. Kairi meets Sora and Riku on Destiny Island, she the adopted daughter of the mayor. The three friends dream of someday exploring the world beyond their island home. Sometime later, Heartless attack the island. Kairi is found in a Secret Place where a strong wind hurls her towards Sora. She disappears upon making contact with him. Sora then goes on an adventure to find Kairi. Unbeknownst to him, though, Kairi’s heart had found its way into his body during the Heartless attack. Images of Kairi appear to Sora on multiple occasions throughout his travels. Sora and Riku become enemies but have the common goal of finding Kairi’s heart to save her, both initially unaware that it has been with Sora all along. Kairi is revived after Sora uses the Keyblade of Hearts, though the latter is turned into a Heartless in the process. Kairi is soon able to help Sora revert back to his normal self, though. After the final battle with Ansem, Kairi is seen back on Destiny Islands. Sora has gone to look for Riku and Mickey as Kairi looks at the drawings she and Sora drew in the past. Kairi does not appear directly in Kingdom Hearts Chain of Memories, but rather as a fragment of Sora and Riku’s memories on their journey. She is mentioned several times by Namine, her own Nobody. 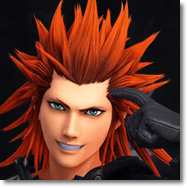 With the game’s focus on Organization XIII members Roxas, Axel, and Xion, it is assumed that Kairi was still living on Destiny Islands, awaiting the return of her friends Sora and Riku. Roxas is forced to battle and defeat Xion towards the end of the game. It is revealed that Xion was an imperfect Replica of Roxas to serve Organization XIII if Sora and Roxas become useless to their goals. Xion visibly resembles Kairi due to her being Sora’s strongest memory when she was created. Kairi is a student at Destiny Island’s school in Kingdom Hearts 2. She finds difficulty remembering Sora since Namine interfered with her memories. She is soon kidnapped by Axel and taken to the World That Never Was. Kairi also learns to fight with a Keyblade and is reunited with Riku and Sora. After Xemnas is defeated, the three friends return to Destiny Island. 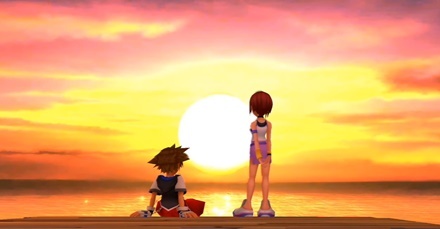 Kairi appears as a flashback to Data-Sora, showing the girl with Riku in Neverland. Kairi appears as an illusion to Sora in The World That Never Was. It has also been revealed in the secret ending that Kairi will undergo training in using a Keyblade to defend herself from Organization XIII. 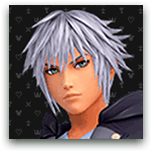 Kairi is seen in Yen Sid’s tower who suggests to Riku and Mickey that she and Lea train as Keyblade wielders under Merlin.